20 points: Read a modern retelling of a classic (e.g. an Austen Project novel, Vinegar Girl by Anne Tyler, etc.) — Submitted by SCSBC16 winner Kaity. 25 points: Read a book with an alcoholic beverage (neat or cocktail) in the title. — Submitted by SCSBC16 winner Kerry. 30 points: Read a book with a character that shares your first or last name. (Alternate spellings are okay, e.g. Megan and Meghan or Smith and Smyth.) — Submitted by SCSBC16 winner Ericka. 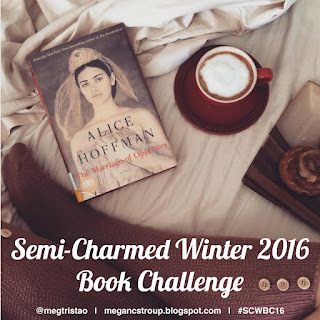 It was with great pleasure I accepted the invitation to choose a category for the Semi-Charmed Winter Book Challenge 2016! After (just) finishing in fourth place in the Summer Challenge, I finally achieved a goal I’ve held since summer 2013. Mostly I have a small boy to thank for it. His sleeping pattern is so non-existent that many a night our room is illuminated from the glow of a kindle as I try to nurse him back to sleep. Read a book with an alcoholic beverage (neat or cocktail) in the title. And I promised Megan that I’d come up with some suggestions. Here they are roughly categorised. While I haven’t read most of them, I’ve linked each one to its goodreads entry – I hope you find something that whets your appetite! The first five Murder, She Wrote series by Jessica Fletcher are all alcohol based. I won’t be trying these due to an irrational hatred of Murder, She Wrote, which came about when we first moved to France and it was the only thing on television. Ever. There also exists a series of Jack Daniels Mysteries by J. A. Konrath, the first six of which are named after famous cocktails. And you could be sneaky with this one too. Many words contain the word ‘gin’ – begin, aubergine, avenging, belonging, engineer – or ‘rum’ – crumb, drum, forum, grumble, instrument. My sleep addled brain is probably missing out on many more (and possibly being optimistic that there is a book out there with aubergine in the title). I don’t think you’ll have any difficulty in finding a book that fits into this category. My list is by no means exhaustive. For what it’s worth, I heartily recommend Campari For Breakfast by Sara Crowe which is a beautiful and hilarious novel about a young woman coming of age pursuing her dream to become a writer while living with her aged aunt in a rundown, ramshackle mansion. I’ll be choosing the sequel, Martini Henry for this category in the challenge. Thank you, Megan, for hosting another challenge. Have fun reading and good luck! Edited: I’ve since been on goodreads and found a huge number of books with aubergine in the title. Seriously, my category could have been Read a book with the word aubergine in the title and you’d have been spoiled for choice! This is Ross. Milk drinker, co-sleeper, night waker, poo maker. And responsible, since his arrival in mid-November, for turning his mother's brain into mush. So much so that she can't concentrate on any books that require a modicum of thought. Which is why I sadly need to resign from The Semi-Charmed Winter 2015 Book Challenge. I hope to get round to reading most of the planned books during the year to come, but at the moment I'm happy to indulge in the Sookie Stackhouse novels by Charlaine Harris. A guilty pleasure maybe, but a pleasure I can easily partake of in the middle of the night by the light of my kindle. It's almost time (55 minutes to go!) 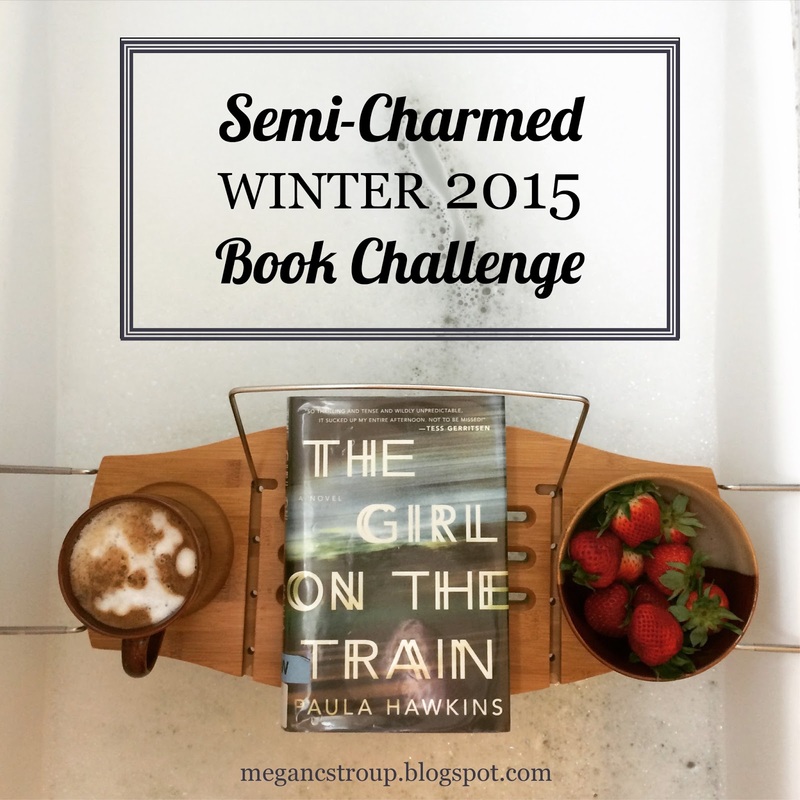 for the Semi-Charmed Winter 2015 Book Challenge. Here is my preliminary list. As you can see, I'm quite undecided about one or two categories. I'm also a little worried that I appear to have favoured books that are somewhat on the long side. But we shall see how I go, I suppose. All suggestions and comments are welcome! 15 points: Read a book published under a pseudonym (e.g. Robert Galbraith, Sara Poole, J.D. Robb, Franklin W. Dixon, Mark Twain, etc.). — Submitted by SCSBC15 finisher Megan M.
Lemons, destined for a fruit cake. In one of my favourite bowls. 932 paper cranes - our contribution to my sister's upcoming wedding. Slightly colour enhanced, but my legs are the brownest they have ever been. And it beats a photo of my peeling skin - a reminder of the day when we spent slightly too long on the beach.